We had a great time and look forward to next year. the cabin was adorable. Might make a trip in the summer for a kayak trip up and maybe this winter for snowmobiling ❗ It was a wonderful stay. The JMRRCOC is sponsoring a one night show with Bob Marley. If you are staying with us, give us a call and we will reserve the tickets for you. If not, contact the chamber of commerce for more details. Just a quick post to wish you Mom-s a happy day today! We hope everyone finds time to visit with or call your Mom today or think of their moms if they are not with you anymore. They deserve it. 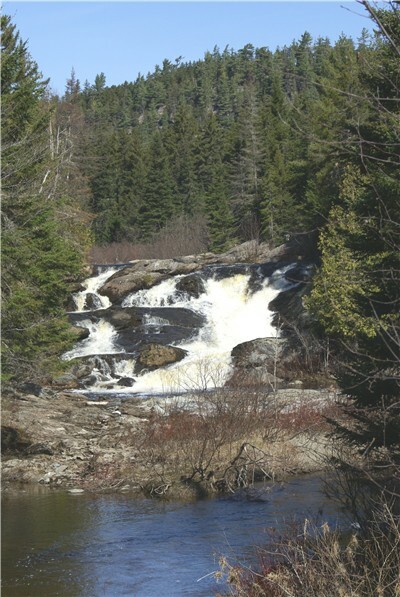 Steve, Murphy and I took a ride out Holeb Road this morning and got a few shots of the West branch Falls. I wish I had the video camera though as the sound they were making as they rush over the rocks was much stronger than what you can imagine in the photo. But it was an incredibly BEAUTIFUL day and worth the ride out there. After the ride, we came back to Cozy Cove Cabins to enjoy the rest of the day outside and do some yard work. As the lake recedes, the yard work is a daily event 😉 But we still had a good day since our friends stopped over to visit and helped out with the clean up which made the day go much faster. Just a quick post to wish you Mom-s a happy day on this glorious spring day! We hope everyone finds time to visit with or call your Mom today or think of their moms if they are not with you anymore. They deserve it. What a great new option for summer fun in the region is to rent an ATV in Jackman ❗ Maxx-s ATV Rentals is opening there doors this month. You can contact them at www.maxxsatvrentals.com. Kevin or one of his family would love to help you have a great time. They will be located at Dana-s Snowmobile Rental (just up the street from us) this season with more plans for the future. So if you ever wanted to try ATV riding or want to see this beautiful region and all the nature you can find closer than with a car, rent an ATV here in town and go exploring. Or if you already have your own ATV but your friends do not, bring them along and enjoy the weekend riding the more than 300 miles of trails we have here in our region. ATV trail access is right from your cabin door at Cozy Cove Cabins:) Call soon to make your reservation. Trails generally open Memorial Day Weekend. 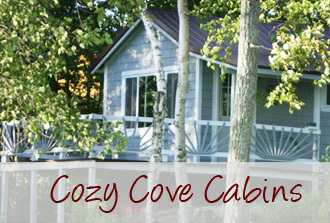 Today is our 4 year anniversary at Cozy Cove Cabins. YEAH!!! And we still love what we are doing and do not regret a moment. We set goals when we arrived for a 5 year plan of things we wanted to do. And since we still have another year to reach these goals, I think we are on target. Cabin 5 was and is our biggest project yet. We started that in March and simply, because it is started, we can see a light at the end of the tunnel. Ice Out contest winners 2008! 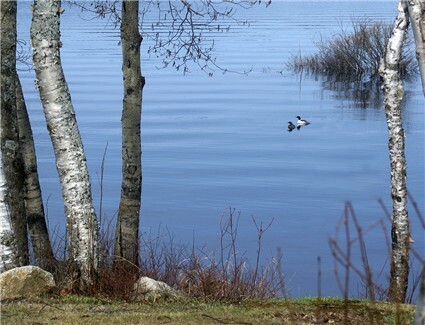 I thought for sure the ice on Big Wood Lake would be gone last week. We had a bit of a wind one day which pushed what was left along the eastern shore. And in the past few days, this is where it has been hovering. BUT by evening, there were only remnants of ice tucked into our cove. We also saw 3 boats out on the lake during the day and fishing poles. Without having Allen Duplessis-Four Seasons Restaurant (He records the ice out date, snowfall, temp for the region) or the town hall to confirm this yet, we believe Ice out for 2008 on Big Wood is May 3rd. Which means there are no winners this year in our Ice Out Contest 🙁 2 people were very close but most of us, including me, were WAY off. Remember this for next year as I think we will do it again. On Monday, I will call to confirm this date and if by chance I am wrong, I will correct this entry. It should be up and running again by tomorrow or maybe Monday at the latest.